The NVIDIA® NVS™ 315 delivers incredible flexibility, scalability, and compatibility that lets you get the most from your existing display infrastructure. This version of the NVS 315 is ideal for DisplayPort users, or new installations where DisplayPort monitors are required. NVIDIA nView and Mosaic work with the NVS 315 to provide a whole new way to maximize your productivity. Easily manage many windows across multiple high-resolution displays and virtual desktops with a panoramic overview of your entire workspace. Best of all, the NVS 315 is designed with simplified IT management in mind, including advanced tools that make integrating and maintaining a large-scale PC deployment fast and easy. PNY provides unsurpassed service and commitment to its professional graphics customers offering: 3-Year Warranty, pre- and post-sales support, dedicated Quadro Field Application Engineers and direct tech support hotlines. In addition, PNY delivers a complete solution including the appropriate adapters, cables, brackets, Software installation disc and documentation to ensure a quick and successful install. Industry's first unified architecture designed to dynamically allocate GPU resources for optimized performance. Provides a means to connect into the most exhaustive options of display technologies in a low-profile graphics card through low-cost DMS-59 cable adaptors (includes DMS-59 to dual DisplayPort adapter). Provides flexibility and advanced cable management capabilities by enabling DisplayPort 1.2 display features, including multi-stream technology and stream cloning. NVIDIA NVS graphics products deliver the industry's best image quality, sharpness, and pixel tracking for both analog and digital LCDs, DLPs, and plasma displays with resolutions up to 2560x1600. Combines high-definition video processors and software that delivers unprecedented picture clarity, smooth video, accurate color, and precise image scaling for SD and HD video content. Features include, high-quality scaling, spatial temporal de-interlacing, inverse telecine and high quality HD video playbackƒ? ?with low CPU utilization and power consumption. Support for next-generation operating system that will mark a dramatic improvement in the way the OS takes advantage of the graphics processing unit (GPU) to provide a more compelling user experience. By taking advantage of the GPU for both graphics and computing, Windows 7 will not only make todayƒ? ?s PCs more visual and more interactive but also ensure that they have the speed and responsiveness customers want. Parallel-computing architecture that enables dramatic increases in computing performance by harnessing the power of the GPU (graphics processing unit). NVS 310 contains 48 NVIDIA CUDA parallel-computing cores compatible with all GPU-accelerated web, photo, video applications, as well as next-generation Internet technologies. 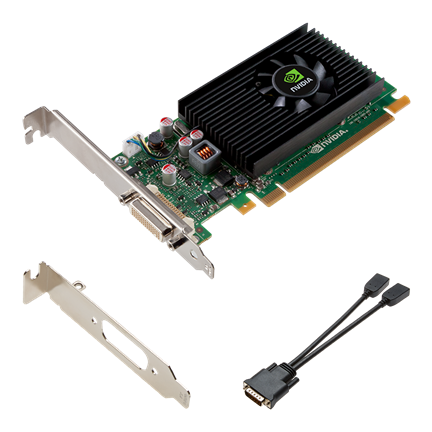 Learn how NVIDIA Quadro professional graphics boards can accelerate any SolidWorks-based workflow. From inspiration to initial customer delivery Quadro delivers all of the latest SolidWorks features, such as RealView, enabling unprecedented design interactivity and productivity.